Rhinoceroses caused a stir when they were exhibited in Europe and America. The menagerie in the Tower of London closed in 1834, but English monarchs had been collecting a wide variety of wild animals since the Middle Ages. 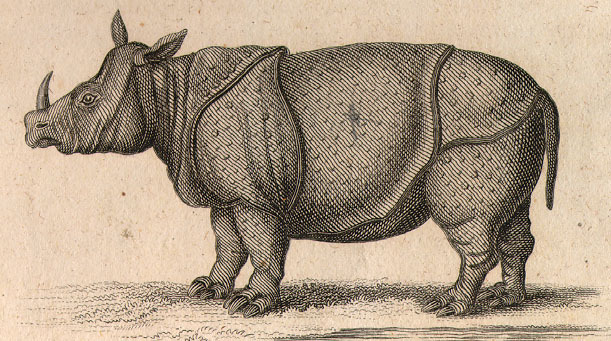 By the eighteenth century, public displays of “remarkable” animals were common. 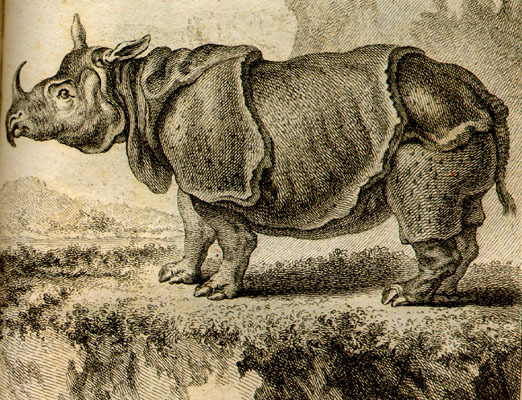 Creatures like this Indian rhinoceros (from Buffon’s Histoire Naturelle) suggested that “nature” was much more diverse and strange than it seemed in a “civilized” English garden. Rhino horns, along with narwhal tusks, were gradually accepted as sources of the legends of unicorns. They were also used, throughout Asia, as aphrodisiacs. Animals with unusual physical characteristics also came to be linked with extinct species and fossil remains. Images, like this rhino from Goldsmith’s widely circulated Animated Nature, allowed the general public to gaze upon what seemed like a living dinosaur. 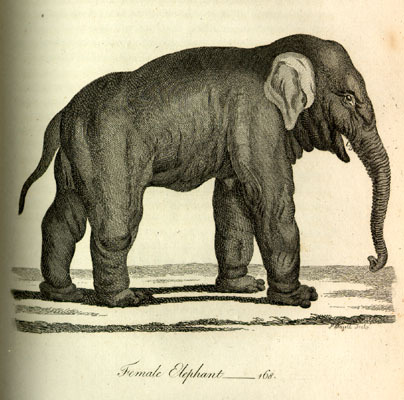 Elephants (like this apparently undernourished one from Pennant’s Quadrupeds) were among the most widely known and exhibited of exotic animals. These animals were remarkable not only for their size and unique anatomy, but also for their often noted “sagacity.” Travelers reported their virtual domestication in southeast Asia, where they had been used as work animals for centuries when Europeans arrived. Public displays, however, were sometimes a threat to the creature’s life. Keith Thomas notes a 1682 display during which an elephant died in an accidental fire and a 1720 pachyderm whose death was fostered “by the great quantity of ale the spectators gave it” (278). Crocodiles, and alligators (with which they were often confused) have been sources of fear and wonder since ancient times. William Bartram‘s 1791 account of these dragon-like reptiles locked in seemingly mortal combat–in his Travels in the Carolinas, Georgia, and Florida–captured the fascination and the terror evoked by the power and mystery associated with such dinosaur-like creatures.